On July 4, 2017, North Korea successfully tested the Hwasong-14, firing the missile at the steepest possible trajectory to avoid overflight of North Korea’s regional neighbors. The test was a milestone as it marked the country’s first successful test of an ICBM. During the test, the Hwasong-14 flew for around 40 minutes, reached an altitude of 2,802 km, and traveled approximately 930 km before landing in the Sea of Japan. Experts speculate that if launched at a normal trajectory, the missile would have flown approximately 6,700 km, allowing it to reach as far as Alaska. However, on July 28, 2017, North Korea conducted its second successful test of the Hwasong-14. Again North Korea fired the missile at the steepest possible trajectory, but this test significantly outperformed the previous test. 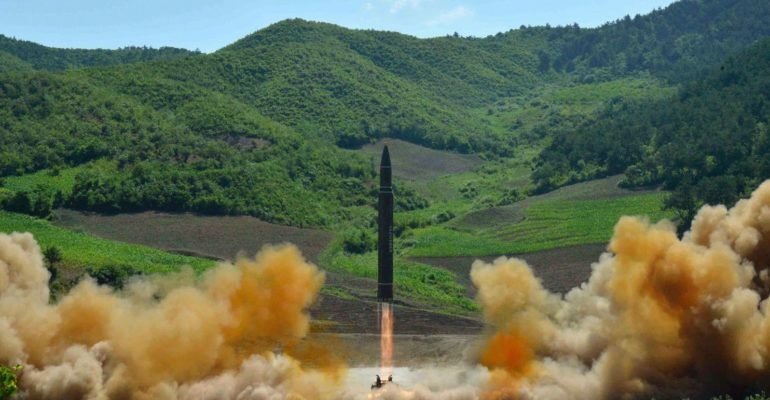 During the July 28 test, the Hwasong-14 flew for approximately 45 minutes, reached an altitude of 3,700 km, and traveled about 1,000 km before falling into the Sea of Japan. Based off this test, if launched on a more normal trajectory, experts believe the Hwasong-14 ICBM would have a range of 10,400+ km, allowing it the range to reach most of the continental United States. It is speculated the Hwasong-14 is just the intermediate-range Hwasong-12 with a second stage added to give it the intercontinental range. The Hwasong-12 was first successfully tested on May 14, 2017, on a lofted trajectory similar to the Hwasong-14. The missile’s successful test on July 4, 2017 mark a significant leap forward for North Korea’s missile program, and North Korea will likely put considerable resources behind the Hwasong-14’s production and deployment. The Hwasong-14’s 10,400+ km range, as demonstrated by the second test in July, indicate that the missile could be used to strike Alaska, Hawaii, and most of the continental United States. If North Korea is able to miniaturize its nuclear weapon capability and pair a nuclear warhead to the Hwasong-14 ballistic missile, Pyongyang would be able to hold large swaths of the U.S. population at risk; providing the Kim regime with substantial strategic leverage.